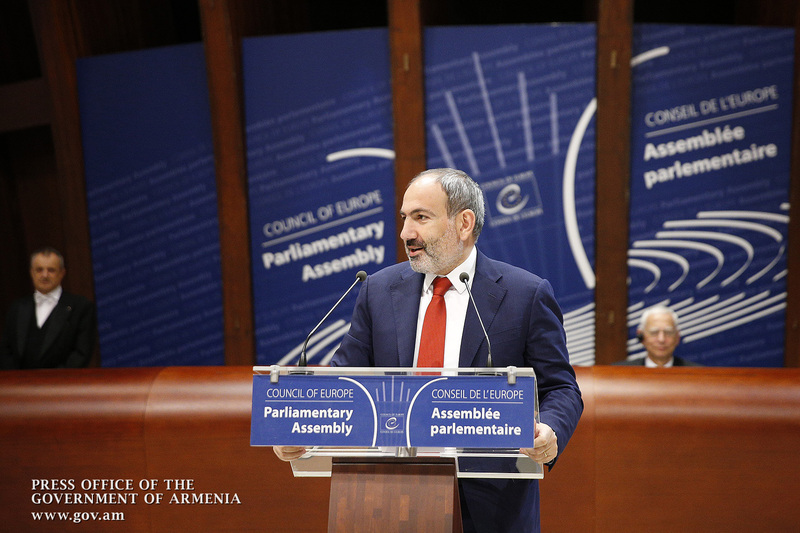 Prime Minister Nikol Pashinyan’s working visit to the Council of Europe continues. 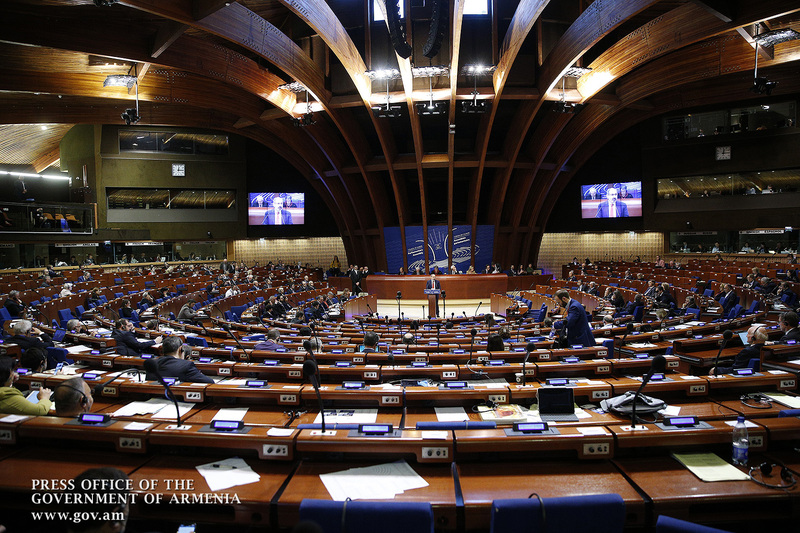 On 11 April, the Prime Minister participated in the Spring Plenary Session of the Parliamentary Assembly of the Council of Europe (PACE). It is an internationally accepted common practice for high-ranking guests to address the audience from this podium with the following words: “It is a great honor for me to speak at the podium of the Council of Europe Parliamentary Assembly.” This is a great honor for me, too, but let me say that speaking from this podium has a special meaning and significance for me. I will try to explain why being the editor-in-chief of the “Oragir” daily in the summer of 1999 I was awaiting the court’s verdict against me. The reason for initiating a criminal case was a publication in my newspaper. The prosecutor demanded that I be sentenced to three years in prison and sent to prison. At that time it was almost impossible for the court to neglect the prosecutor’s motion. But in those days, something like a miracle happened, and the court sentenced me to only one year’s imprisonment so that it could be postponed for a while. Then it turned out that the reason was one. Armenia was going to become a member of the Council of Europe in those days and PACE President Lord Russell Johnston would visit Armenia to discuss membership issues. The authorities realized that a prison sentence was not a good backdrop for such an official visit. In fact, Russell Johnston referred my issue during his visit, and perhaps the authorities promised that they would not send me to prison. That is how it happened. After Johnston’s visit my verdict became conditional, and in 1999-2000, I was not sentenced to prison because of Armenia’s accession to the Council of Europe. And although there were several criminal proceedings against me, my detention was postponed, and it occurred only after the March 1, 2008 events when 10 Armenian citizens were killed, including eight peaceful demonstrators. At that time, thousands of oppositionists were taken to police stations for attending the demonstrations. And nearly one hundred political leaders and activists went to jail as political prisoners. 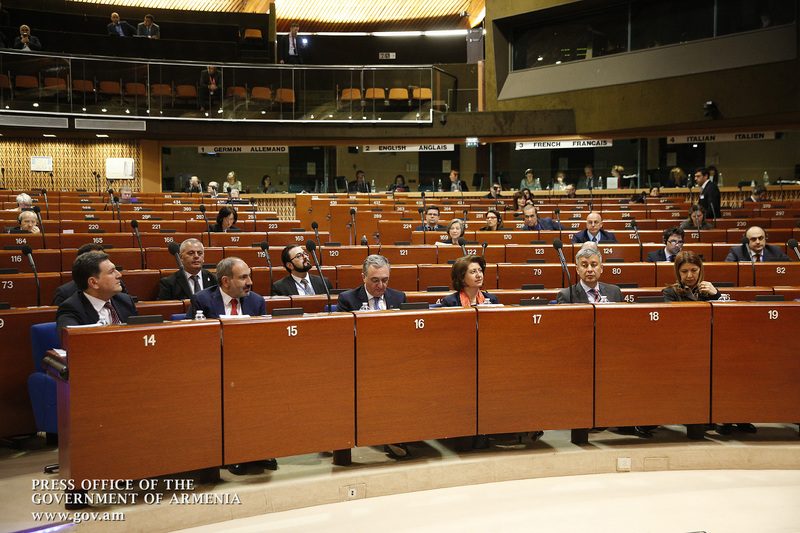 The Council of Europe and the Council of Europe’s Parliamentary Assembly were the only hope for the citizens deprived of their legitimate right of assembly, for imprisoned politicians and their relatives and the relatives of the victims of March 1 events, because after March 1, the Constituency was eventually abolished in the Republic of Armenia and people had no reliable legal guarantee of protection, no hope. And like fresh air, the five resolutions adopted by the PACE on those events changed the atmosphere of Armenia, raising hopes that everything was not yet lost. 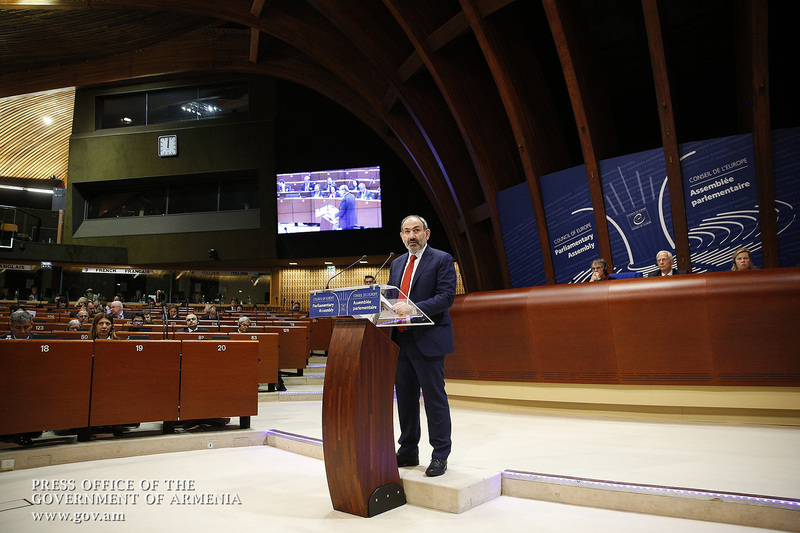 Having been imprisoned since 2009 and sentenced to 7 years of imprisonment in 2010, I spent only two years in jail and came out to freedom with the help of Armenian citizens, but also with the assistance of the Council of Europe. In the winter of 2011, I met with Council of Europe Commissioner for Human Rights Thomas Hammarberg, and it was crucial for drawing attention to the problem of political prisoners in Armenia and to my issue as well. Soon, the European Court of Human Rights recognized my case urgently, two months after that time, the authorities released me with an amnesty act, realizing that the Council of Europe would officially announce me a political prisoner. 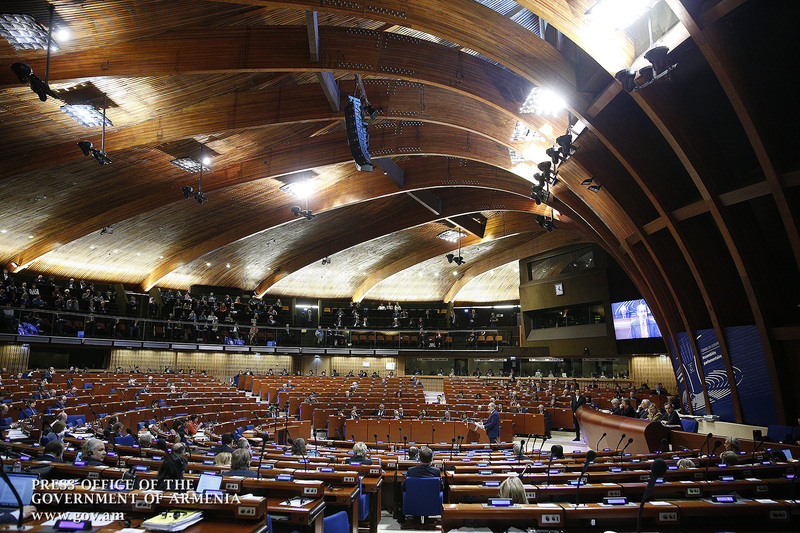 December, 2018 came as the next stage of my relationship with the Council of Europe and PACE. At that time, I was the Prime Minister of Armenia and reached that status as a result of the non-violent velvet popular revolution in April and May of that year. Early parliamentary elections were held in the country as the next port of call of our revolution. Our political force received more than 70 percent of the votes in these elections. But what natters most here is the fact that the PACE observation mission qualified the elections as democratic. I wish to quote the assessment given by the PACE observation mission: “It was possible to hold democratic elections in Armenia due to the so-called Velvet Revolution and the manifestation of political will by the authorities.” Other international observation missions also acknowledged the December elections as free, fair, democratic and competitive. No Armenian election had ever been rated like that before. This was the first parliamentary election in our country, the official results of which were not contested in the Constitutional Court and the first parliamentary elections, the results of which were unanimously adopted by all political forces and the public at large. 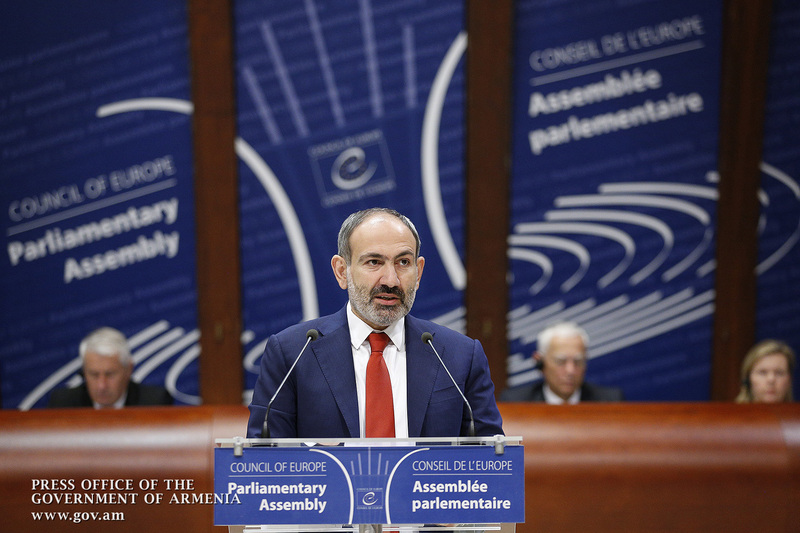 And now, as the prime minister elected by the people of the Republic of Armenia, I would like to thank the Council of Europe, the Parliamentary Assembly of the Council of Europe for their support of human rights and democracy in Armenia. Today, the people have triumphed in Armenia, and this has happened due to the non-violent, velvet popular revolution in Armenia. I want to emphasize that the revolution was born in the heart and soul of the Armenian people, and there was not a single foreign power involved in any way in our revolution. Our revolution neither had a geopolitical content, nor a geopolitical context. But how did this revolution happen? How did it succeed? In 2015, Armenia’s then-actual leader Serzh Sargsyan initiated fundamental changes at the end of his second term, which implied that the semi-presidential form of government in Armenia would have to shift to a parliamentary system in April, 2018. When this constitutional amendment was initiated, he pledged publicly that he would never be nominated to the office of Head of State - in this case, to the post of Prime Minister. But in 2018, it turned out that he was the candidate for premiership, nominated by the ruling majority. On May 31, we started a march of protest, walking from Armenia’s second largest city Gyumri to capital Yerevan. We walked 13 days - more than 200 kilometers - covering the whole process live on social networks. And in Yerevan, in the first place, many schoolchildren, boys and girls joined our movement, followed by their elder brothers and sisters, followed by their mothers and fathers and grandmothers and grandfathers. On April 17, 2018, Serzh Sargsyan was elected as Prime Minister by the Parliament, and on April 22, I appeared once again in prison, and the next day Serzh Sargsyan had to release me and my friends under the pressure of the people; he resigned 15 days later, on May 8, 2018, that same parliament elected me Prime Minister of the Republic of Armenia, because this was demanded the entire Armenian nation. This is how our revolution happened. Called a revolution of love and solidarity, it was originally based on the logic of non-violent struggle. The top open hands were the symbol of our revolution. And that was the sign of our repeated statement that even if the police and the former government exercised violence against us, we would not respond to violence with violence. And the idea of love, the non-violent struggle really won the oligarchic, corrupt system in Armenia for many years. Won without any violence, won without any victims, won without any weapons. Raised up with open arms. Indeed, there are huge political changes going on in Armenia today. We have managed to eradicate corruption in Armenia, eradicate the monopoly system, and create real conditions for all people before the law. We are reducing the black economy in daily routine. Over the past 10 months, Armenia has seen more than 50,000 jobs created or coming out of the shadow, which is 10 percent of the total labor market. Our budget revenues have been overwhelming and we are going to exceed the budget revenues of 2019 by about 70 million euros, or at least by 70 million euros, which is 2.6 percent of our budget receipts. These extra amounts will be used to build roads, educational and health institutions, proportionate territorial development, and jobs. Our government’s activity is transparent and accountable, and our power stems from the free will of the people. 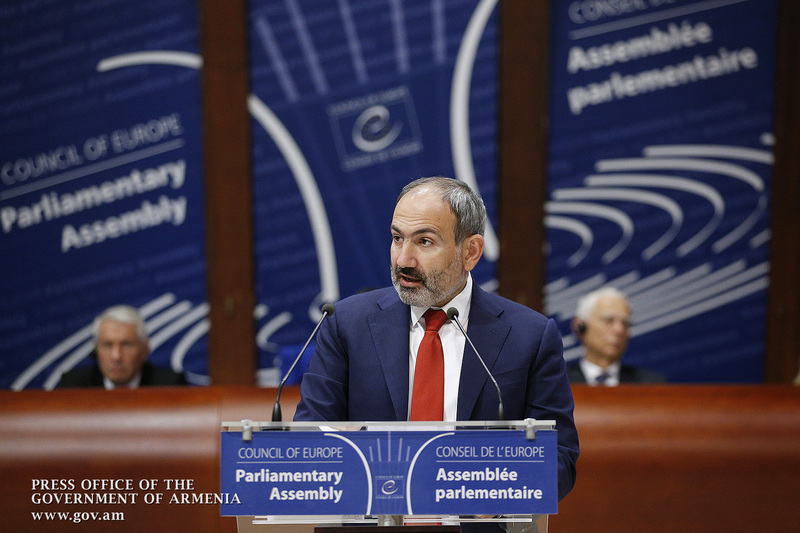 Today, Armenia is a truly democratic country with perfect freedom of speech and assembly. The chapter of electoral frauds and systemic corruption is closed for ever in our country. Our government is taking measures to continuously raise the status of human rights protection. But our democracy needs strengthening, as well as economic and institutional guarantees. 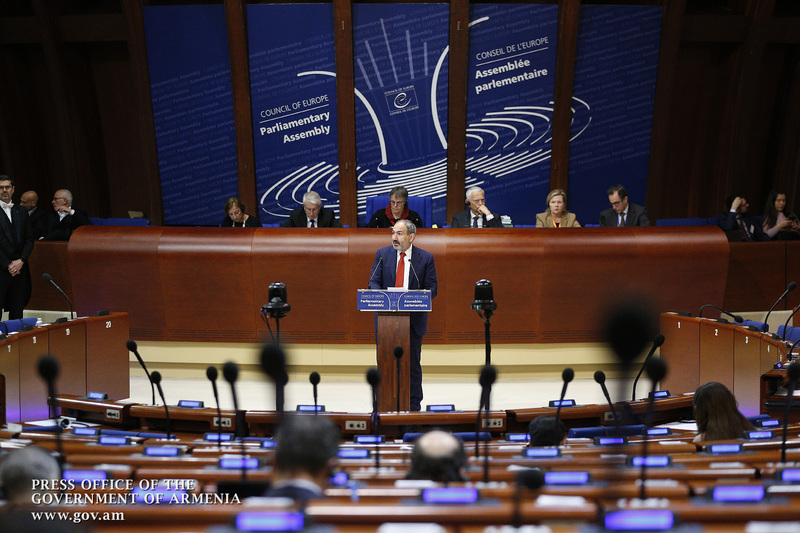 The development of democratic institutions, the establishment of an independent judiciary, the establishment and strengthening of anticorruption institutions are the key areas where we need the support of the Council of Europe. All this is important not only to put on record the results of the political revolution, but also to bring about a new economic revival. The key goal and significance of our economic revolution is to encourage and help our citizens in their economic activities, create real opportunities for them, make Armenia more attractive to investment and tourism, and transform our country into a technological hub. And we are convinced that we will succeed in this difficult mission, because our people now have confidence in their own strengths and their own future. The Nagorno-Karabakh conflict continues to be a major challenge for the Republic of Armenia and for our region, in general. Like any democratic government, the Armenian government is dedicated to the principle of exclusively peaceful settlement. But democratic changes in our country have brought new shades in our understanding of the issue. Of course, it is extremely important that we have been able to start a constructive and positive dialogue with Azerbaijan’s President Ilham Aliyev, but I am convinced that the dialogue between the two leaders is not enough to resolve the issue. It is extremely important that a dialogue be initiated between the communities so that we could prepare our populations for peace, not for war. At the end of a press conference in Yerevan, I announced that social networks can be the most important platform for dialogue, where unfortunately the Armenians and Azeris are still communicating in the language of blasphemy and hate. The thirty years of the conflict seemed to be enough for us to have exhausted the language of hatred and blasphemy. We should help each other in order to understand our respective positions in a bid to find out the reasons behind the conflict. 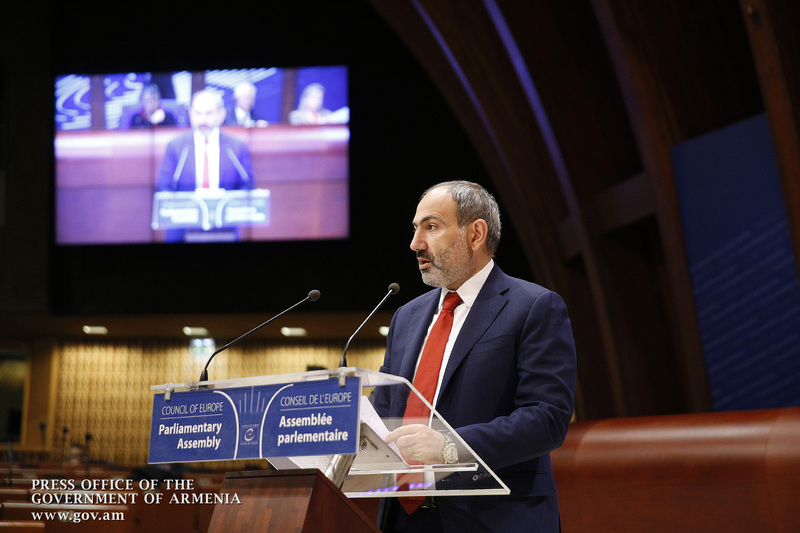 I personally started to voice this vision of mine several times from the podium of the Armenian Parliament, saying that any version of the settlement of the Karabakh issue should be acceptable for the people of Armenia, for the people of Nagorno-Karabakh, and for the people of Azerbaijan. This is an unprecedented statement, as a matter of fact, and it is just the formula that may help us achieve a peaceful settlement of the Karabakh conflict. Unfortunately, we still cannot hear similar statements from Azerbaijan, but I do hope that the message sent from this podium of peace will receive an adequate reaction in the Azerbaijani society. 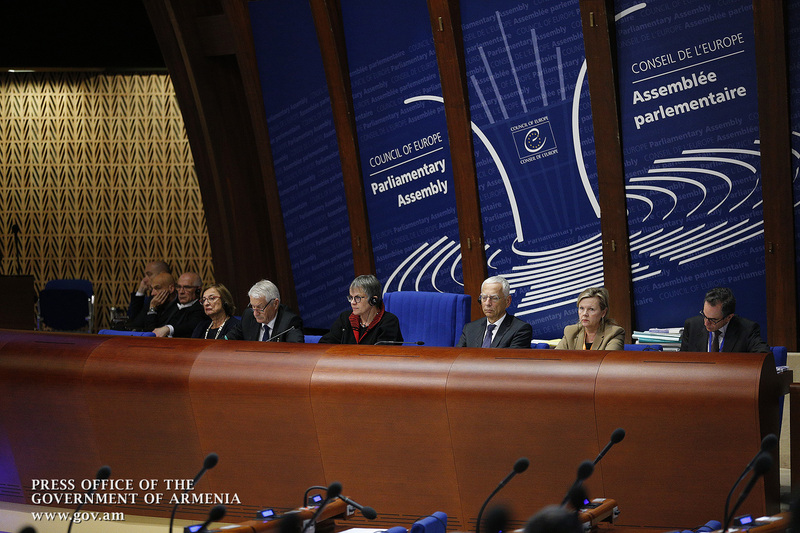 It is no coincidence that I called this podium of the Parliamentary Assembly of the Council of Europe a seat of peace. I believe that this is the place where curses should be substituted with dialogue; where provocation must be replaced by constructive work. But, unfortunately, the chair of the Parliamentary Assembly of the Council of Europe is sometimes used to provoke wars. In this regard, I cannot rule out that the discussions on the Nagorno-Karabakh issue that took place here in January 2016 became the prelude of the Four-Day War that broke out in April of the same year, creating a propitious ground for Azerbaijan’s armed forces to launch offensive operations. I do not want to assert that the authors of those debates consciously triggered the war, which cost a few hundred human lives for Armenia, Nagorno-Karabakh and Azerbaijan. 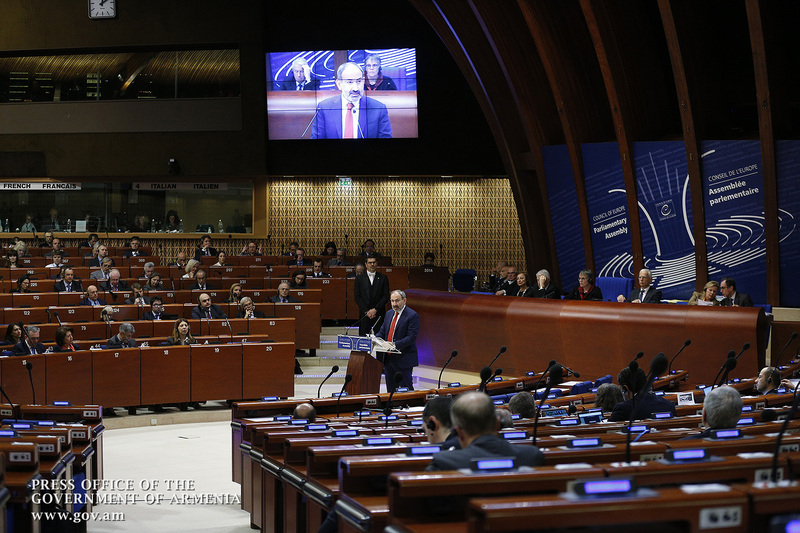 Unfortunately, today as well we can see attempts to turn the podiums of PACE and other international organizations into platforms of geopolitical games and conflicts, which is absolutely opposite to the essence and mission of these organizations. It should also be remembered that any conflict should be viewed in its essence and content, while making judgments about a conflict without understanding its origins, causes, essence and peculiarities simply means to play with human lives and human destinies. This is the reason why we consider and believe that jointly with the three parties to the conflict, the OSCE Minsk Group Co-Chairs are the only ones to deal with the Karabakh conflict because this format has been aware of the current state of affairs, the conflict’s background history and the nuances of negotiations ever since their inception. The OSCE Minsk Group format was set up as a platform for dialogue between all parties to the conflict - Nagorno-Karabakh, Azerbaijan and Armenia - and we are taking steps today to restore the dialogue between Nagorno-Karabakh and Azerbaijan in the format of the OSCE Minsk Group Co-Chairs. 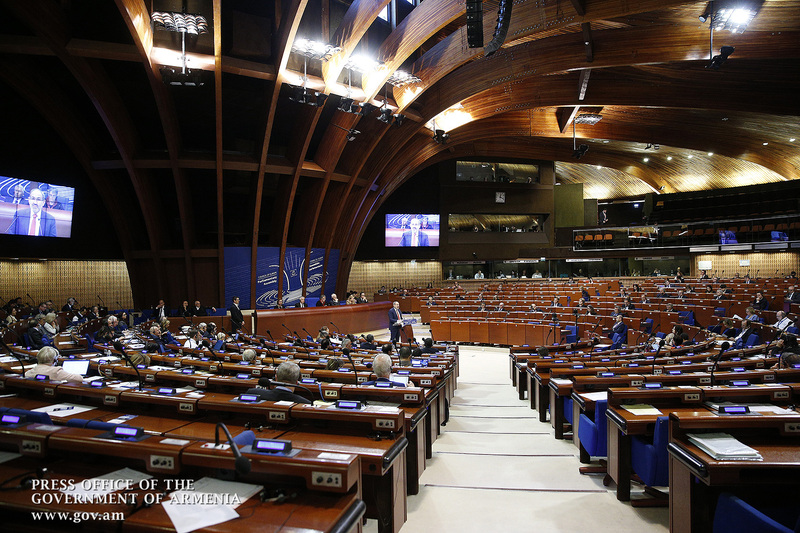 This does not mean that the Council of Europe has nothing to do in the Karabakh conflict zone. This organization, which is at the forefront of human rights and democratic institutions in Europe, pays zero attention to the support of non-governmental organizations operating in Nagorno-Karabakh. PACE has so far failed to take any steps to strengthen democratic institutions and to build civil society in Nagorno-Karabakh. The only explanation is that there are contradictions and misinterpretations regarding the status of Nagorno-Karabakh, which imply that Nagorno-Karabakh is not internationally recognized as a state. 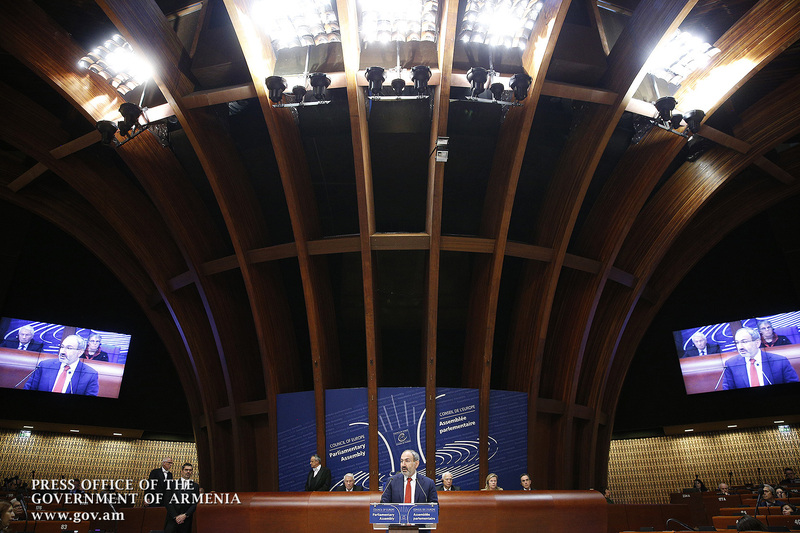 But as far as the Council of Europe and PACE are concerned, the point is not the status of Nagorno-Karabakh. I wonder if there is an international debate about whether the people living in Nagorno-Karabakh are humans or not. I wonder whether the Council of Europe, which is one of the world leaders in human rights protection, prefers the documents to real people. 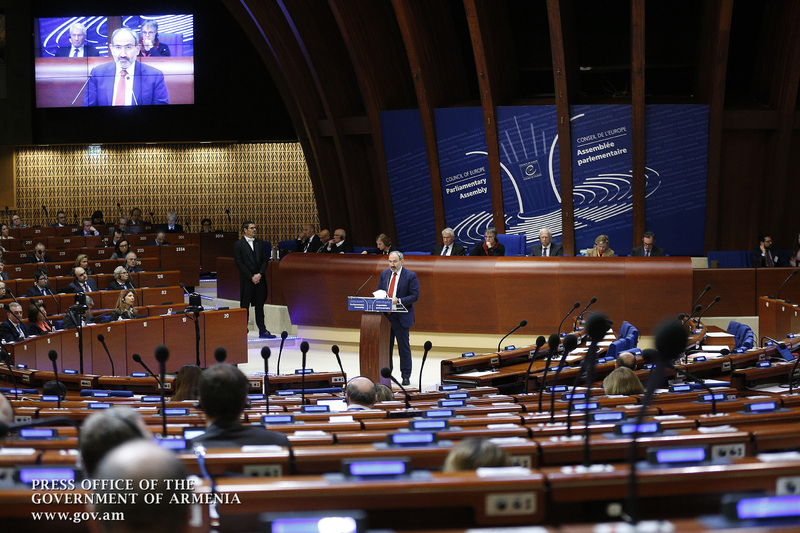 From this high podium, I would like to appeal to the Council of Europe and to all those organizations in Europe dealing with the protection of human rights, freedom of expression and democratic institutions: Please support the people of Nagorno-Karabakh to improve their laws and institutions, strengthen human rights, the rule of law and build an independent judiciary. The citizens, the people will benefit from it. 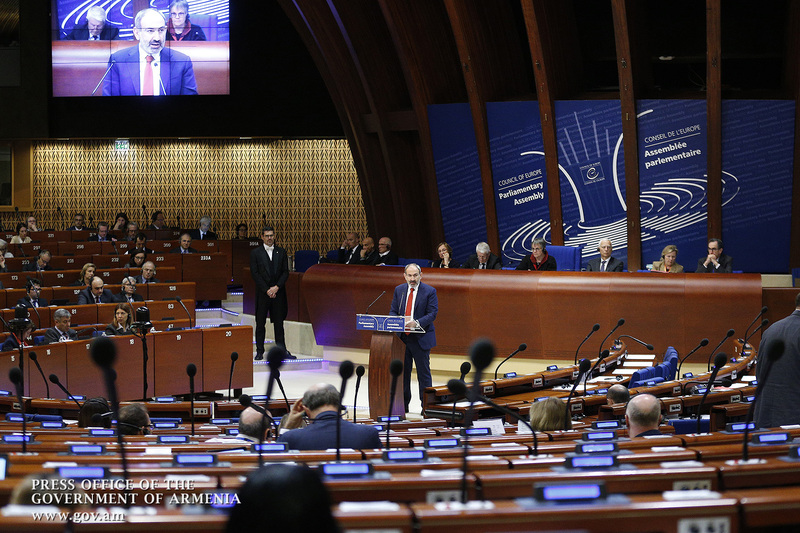 We should remember that humans are worth more than any document, any political or group interest, and I do believe that the Council of Europe, the Parliamentary Assembly of the Council of Europe will be guided by these very values. I am really pleased and honored to deliver a speech from this podium on the occasion of the first anniversary of the Armenian Revolution of Love and Solidarity. Recognizing Armenia as the country of the year in 2018, the Economist asked whether Armenia could build on its achievements. 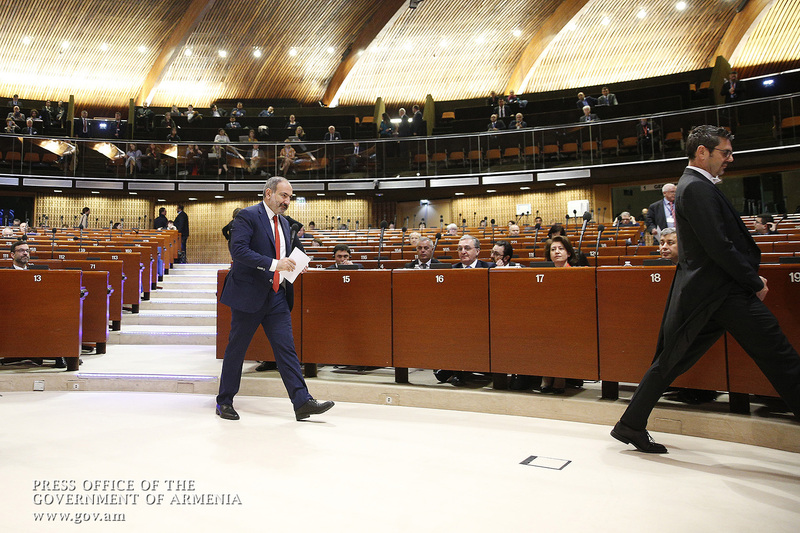 I have the honor to declare from this high podium that democracy is irreversible in Armenia. 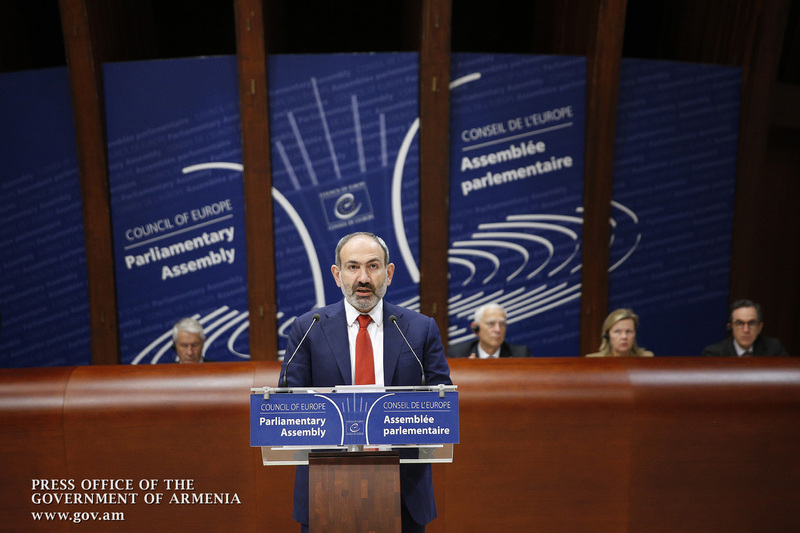 It is irreversible for a simple reason: the aforementioned victories in our country were not brought about by political leaders or forces, but by our people, citizens, the youth who know very well that they are the driving force behind progress and they will definitely not miss the chance to make of Armenia a beacon of democracy, law, liberty and tolerance. Armenia can stand for and will come as a piece of good news for all those who believe in democracy!